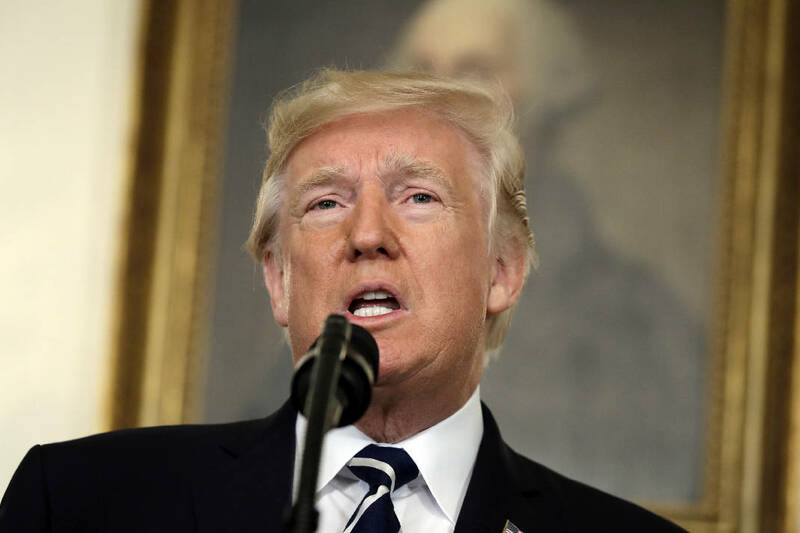 WASHINGTON (AP) - President Donald Trump condemned the mass shooting in Las Vegas - in which at least 59 people were shot dead - as an "act of pure evil" and declared the nation would unite behind the survivors, but he refused to get into a new debate over gun control. Trump spoke slowly and carefully Monday morning from the White House Diplomatic Room, focusing not on the identity or possible motive of the gunman but on the nation's efforts to heal. The remarks were the prelude to a two-part test of whether Trump, a leader who excels at political provocation, can also deliver solace. Trump is slated to visit Puerto Rico Tuesday to survey devastation from Hurricane Maria, before going to Las Vegas Wednesday to meet with families of the dead. Trump spoke hours after a gunman on the 32nd floor of a Vegas Strip casino opened fire on people at an outdoor country music festival below. The gunman, 64-year-old Stephen Craig Paddock, killed at least 59 people, police say, as tens of thousands of concertgoers screamed and ran for their lives. More than 500 people were hurt. In a measured statement that was revised by aides until moments before he spoke, Trump praised the first responders who he said prevented further loss of life. He said he would visit Las Vegas on Wednesday. He offered condolences to the families of those killed, saying: "We cannot fathom their pain. We cannot imagine their loss." Trump, who owns a hotel in Las Vegas, told associates that he feels deep ties to the city. He said in public that his visit would be "a very, very sad moment for me ... for everybody no matter where you are, no matter what your thought process." The president was informed of the shooting early Monday by chief of staff John Kelly, according to White House press secretary Sarah Huckabee Sanders. He received periodic briefings from Kelly and White House homeland security adviser Tom Bossert while also monitoring the coverage on cable news. On Twitter, he avoided the kind of inflammatory statements he has issued after some previous tragedies, instead offering "warmest condolences" to victims and their families. Trump's visit to Las Vegas will come a day after he travels to hurricane-ravaged Puerto Rico, where many have accused the federal government of an inadequate response. Aides have worried about the response he will receive there, as Trump spent the weekend attacking the mayor of San Juan while consistently painting a rosier picture of the recovery effort than what has been described by those on the ground. Like presidents before him, Trump marked the Las Vegas shootings by ordering the American flags at all public buildings across the nation flown at half-staff, and he observed a moment of silence on the White House lawn. Unlike his predecessor, Barack Obama, who responded to mass shootings by calling for stricter gun control measures, Trump made no mention of firearms restrictions.